The peoples of Terra Mystica for centuries have worked to make the land hospitable for their own kind. Harnessing magic and the power of the four elements, they have toiled incessantly to form the land to their desires. And then they got smart phones and tablets. Now it’s much easier to terraform the land. For one thing, they don’t have to dig out their wooden runes. And rather than relying on magic (which is of suspect dependability) and other races joining them at the table (a near impossibility), they have everything they need right at their fingertips in a compact device. But is technology’s arrival in Terra Mystica an unalloyed good? Terra Mystica (the board game and the app) is an engine- and network-building/resource conversion game for one to five players. 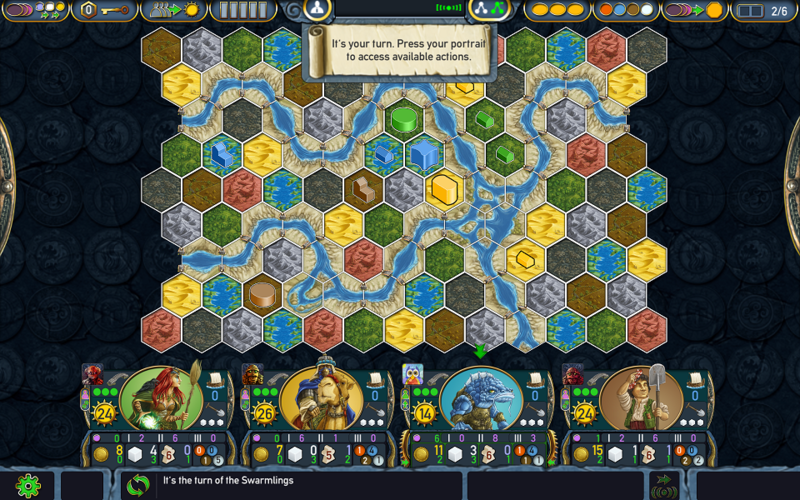 Players control fantasy races in the land of Terra Mystica, trying to shape the land into habitable quarters and advance in the elemental religions. The player with the most victory points is the winner. Which way will you play? At the start of the game, round bonuses (which mete out victory points based on various conditions) are assigned to each of the six rounds of the game. Eech player chooses one of fourteen different fantasy races, each with unique advantages and different home terrain. 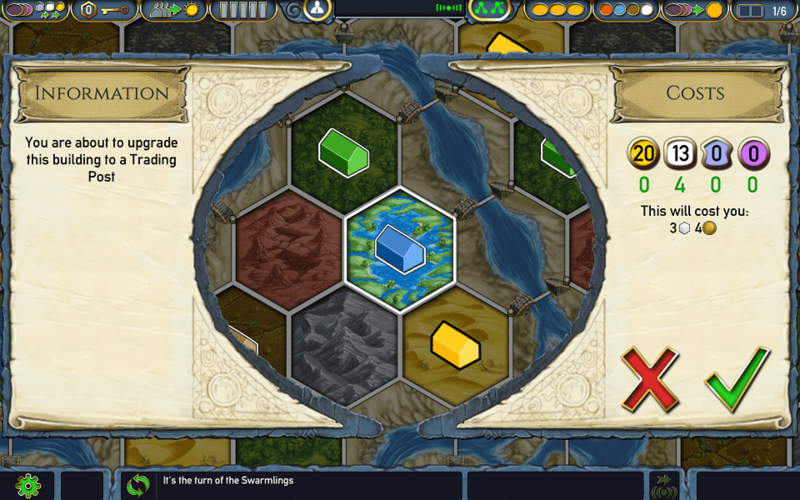 Players receive starting resources and place their starting dwellings on the board. Play proceeds clockwise. On a turn, a player may perform only one action. Actions include building dwellings, upgrading dwellings and other buildings, making their shovels more efficient for terraforming, upgrading shipment, advancing on the four cult tracks, or using either personal or communal action spaces. There are several resources to manipulate in Terra Mystica. Workers are used for terraforming, building, and upgrading. Priests are used for upgrading and advancing in cults. Money is used for building and upgrading. There are opportunities to convert a separate resource (power) into money, workers, and priests. Power also acts as a common resource for activating the communal actions on the board. Players receive some benefit from being close in proximity to one another, but being close also limits expansion possibilities. This handy screen shows you which options you can still afford. Some buildings offer permanent abilities to players (each race’s stronghold, for example, offers a faction-specific ability; temples and sanctuaries offer favor tiles, which players choose from a common supply). Players are also encouraged to build connected settlements for end-game scoring and to receive town tiles, which offer immediate benefits and points. Once a player has run out of actions to do in a round, that player passes, taking a bonus tile. If the player is the first to pass, he or she also takes the first player marker. 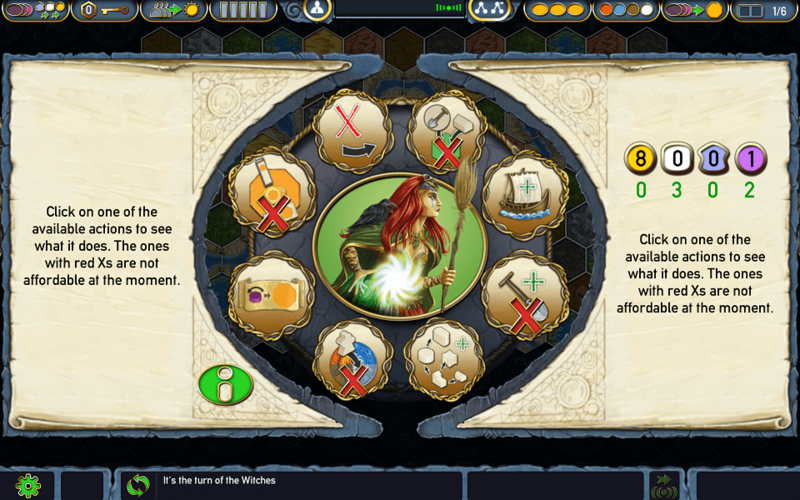 Once all players have passed, the three remaining bonus tiles receive a coin each, and round bonuses are awarded based on players’ position in one of the cults. 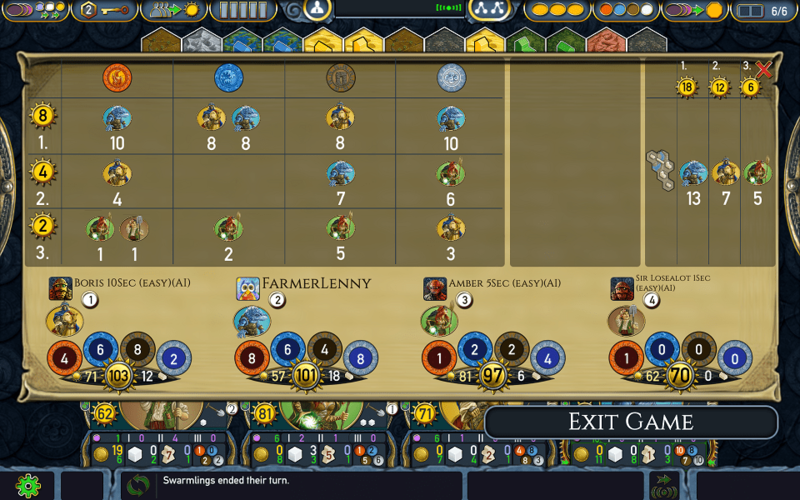 At the end of six rounds, players receive bonus points based on their position in the cults and on how many of their buildings are connected. The player with the most points wins. Note: There is a lot more to Terra Mystica. This brief overview, as in every review, is not intended to be comprehensive but to give you the gist of the game. After years of avoiding one of the top games on Board Game Geek, I finally brought myself to learn Terra Mystica this February, and I immediately saw what all the fuss is about. I played two more times shortly after that (feverishly acquiring my own copy), and Terra Mystica is now among the games that I want to play and play and explore in depth. It’s a new favorite. Unfortunately, tabletop Terra Mystica takes a while to set up, play, and teach, and my game group likes variety. The app could not have come at a better time. The app knows what you want to do when you tap on something, but it still always asks you to confirm your choice. You confirm individual choices and your whole turn’s actions. The Terra Mystica app does an excellent job of translating the board game to the digital realm. While the app recognizes that nothing can replace the chunky wooden bits we’ve all come to know and love–most of the game is reproduced, in form and function, directly copying the physical object–the app does have some innovations that simplify the game for new players. At any time, you can click on your race’s portrait and see the menu of options available to you on your current turn, with each dead end conveniently Xed out. This saves some time as players no longer need to count and recount their meager resources to see if there’s any possible way to get in that final upgrade. You can also open the bonus scoring window at any time for a preview of who would win if the game ended right at that moment. It shows at a glance who is winning which bonuses and how close the standings are in each of the cult tracks. Since there are lots of points scored at the end of any game of Terra Mystica, this is a handy way to shore up any deficit you see in your game before it’s too late. Beyond these conveniences, the app introduces a few innovations. The default setting, for example, is for players to begin the game with variable victory points dependent on which faction they choose. A variant map (available on Board Game Geek as a print-and-play) is included as an option, and the passing rules from the Terra Mystica expansion (where full turn order for the next round is set in passing order) are included as a standard mode. The early game in progress. Playing Terra Mystica is smooth and intuitive (if you know how to play), and the app is good at guessing what you might want to do. If you tap on an empty land hex, the app recognizes that you probably want to terraform (or build, if the land type is right). If you tap on your dwelling, the app assumes you want to upgrade, and the app offers you options when you tap your trading post. The app offers you options having already calculated the conversions you can make, so you can do this with one tap instead of several (converting power to workers and money and then paying these workers and money to build, for example). You can access the full range of options from your player portal, but if you already know what you want to do, there are faster ways to access every action except passing. And the app is kind enough to you that if you make a blunder (realizing something will cost you more in nonrenewable power than you thought, or accidentally choosing the wrong building to upgrade), there’s a handy reset button. Because each turn must be confirmed before the next player can go, the smartness of the app doesn’t allow the players to relax into lazy mistakes. This is a boon. The end of the game is nigh. The Terra Mystica app has a pass-and-play local option (which I have not tried; if I have players willing to learn in person, we will play the cardboard version), along with several different AIs. These AIs are all dubbed “easy,” with the promise of harder AIs to come. But even these AIs are distinguished in difficulty. There’s Sir Losealot (the quick-thinking but dimwitted AI), Amber (the 5-second AI), Boris (the 10-second AI), and Sir Thinkalot (the 15-second AI). It may reflect more on me as a player than on the AIs, but I find the harder of the easy AIs tough to beat. I’m a new player with only three physical games under my belt, and I’m still exploring the various factions, so for me, the AI difficulty is about right. Even so, my games against the harder AIs have been close, even with races unfamiliar to me, so the AIs as currently implemented might not satisfy tournament-level competitive players. Edged out by Boris–just barely! This screen gives you up-to-date information during the whole game. 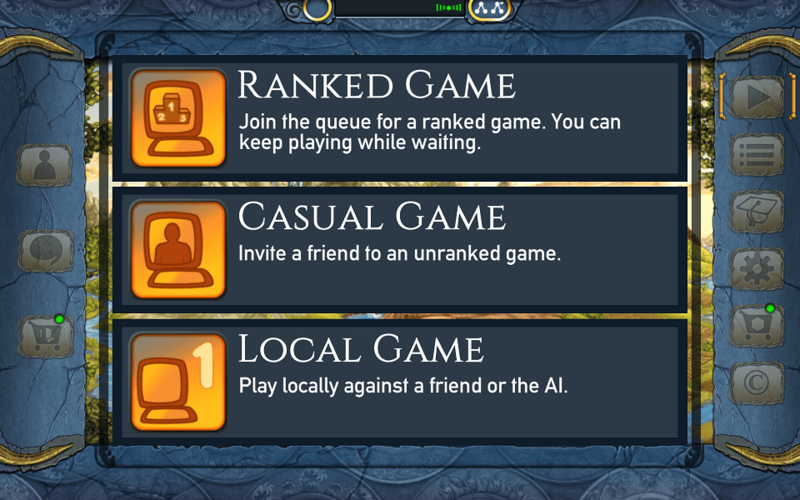 For these players, the app offers online asynchronous multiplayer of two varieties: casual friend play and ranked games. I, unfortunately, don’t have any friends who were willing to shell out $10 for the Terra Mystica app (despite my telling them it’s great), so I didn’t get to try the friend feature (although this works well in another Digidiced app, Patchwork, and seems to rely on a similar system). For the asynchronous multiplayer, you can tell the app how many games you want to join, and it will find new games for you. Although be advised: with three or so other players worldwide having to take their turns before you, these can be sluggish affairs while you wait for things to happen. There’s also the option of joining the queue for a “fast” game, which offers a stricter between-turns time limit, if you’re interested in a closer experience to the board game. It’s hard for me to review the tutorial for Terra Mystica. I already knew how to play the game before downloading the app, so while I sat through screen after screen for review purposes, I didn’t really learn the game from it. The app begins with humor, poking fun at the behemoth rulebook for the game. And it’s true: while Terra Mystica feels elegant once you know how to play it, there’s a large barrier to entry that is the rules. The rules explanation the first time I played took the explainer forty-five minutes. I got it down to twenty or thirty when I taught the game, but even so: twenty to thirty minutes of rules explanation is a lot. So the tutorial here is by necessity going to be more meaty than, say, the Red7 tutorial. That being said, it seems like more time was spent on the early tutorial to make it more engaging; as you progress through the levels, it’s more of a straight rules slog to finish. It’s probably best to do the walkthrough, anyway, but if you are good at learning from the rulebook, you might as well do that instead. The app implementation is smart and usually can tell what you’re trying to do just by tapping on things. As I said, it’s very intuitive if you already know how to play. 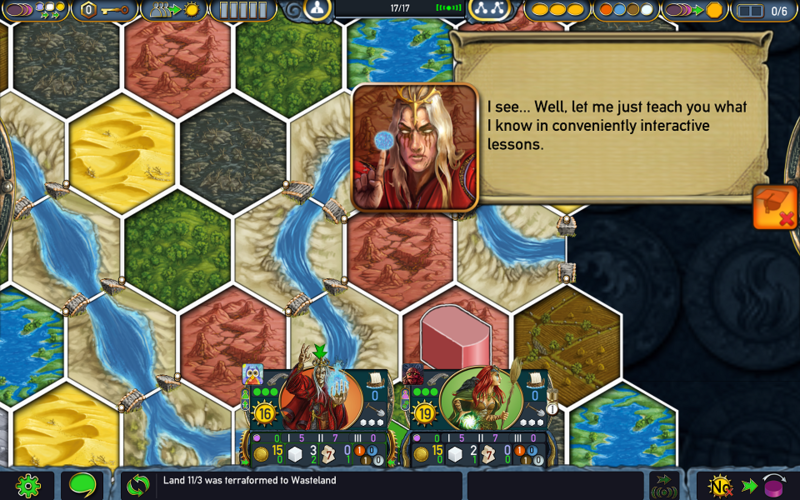 If you don’t…well, a long tutorial is in your future either way, as Terra Mystica isn’t the kind of thing you can just pick up and learn on the fly. This screen appears after the Chaos Magician acolyte complains that the rulebook is twenty pages. The tutorial seems serviceable, although it might be better to learn the game outside of the app. 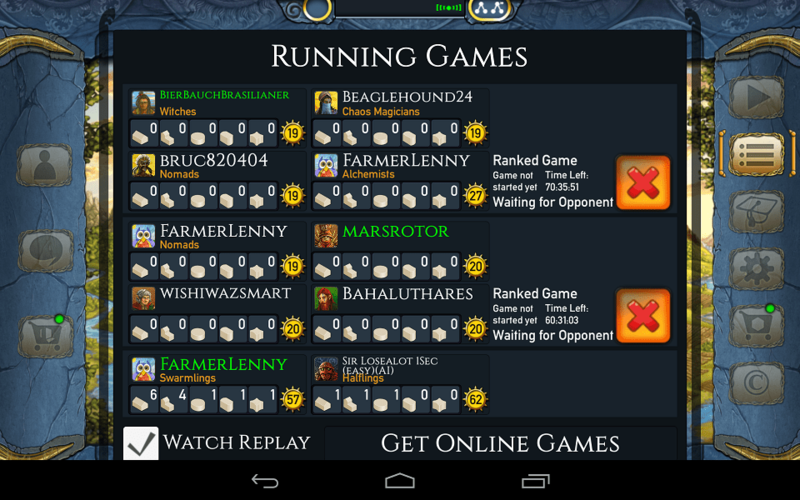 The downside of the Terra Mystica app is that if you want to sit down and play a full game, it still takes a while. If you play against the quick-thinking (and slightly dimwitted) AIs, you can usually knock out a game in forty minutes to an hour, give or take (depending on how much deliberation you’re prone to), and this has been my primary experience with the app as I’ve wanted to experiment with the races I haven’t played. As mentioned before, the app does allow for asynchronous multiplayer, aided quite cleverly by a system whereby players indicate in advance how many points they’re willing to give up in order to gain power from other players’ buildings. What could have been annoying asynchronous microturns is taken care of by preplanning. Nevertheless, even with asynchronous play, Terra Mystica is not the kind of game (at least for me) that I can casually engage with and then forget. What makes the board game so much fun, even with deliberate players, is how immersive it is (in every sense but thematically). Every decision counts, and even though you have unlimited actions (at least while you can still do things), the order in which you do them matters a great deal. Asynchronous play gives while it takes away. It gives players freedom to not be tethered to their devices…at the expense of not being fully engrossed in the game. Again, this isn’t necessarily a bad thing. The Terra Mystica app is an outstanding implementation of the game, and the translation of the game into an app offers some nice innovations that will aid both novice and experienced players. 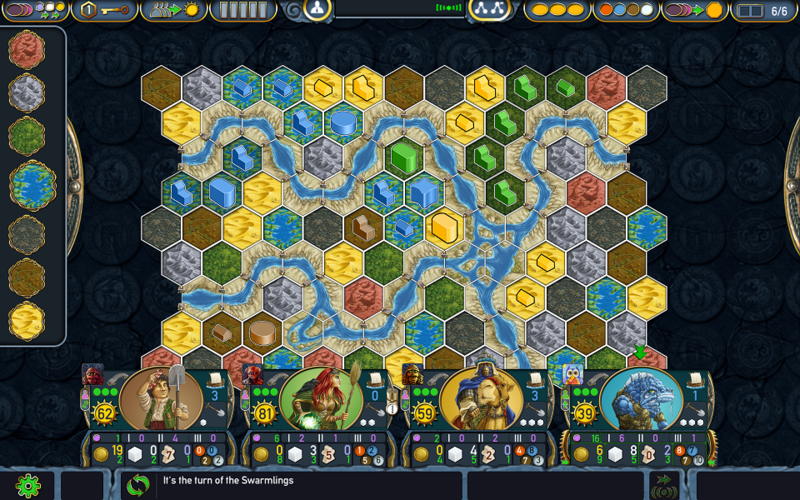 It is exactly what I would have from a Terra Mystica app: it uses the advantages of the medium to smooth calculation while maintaining the core of strategy and tactics from the physical game. And having more opportunity to play the game is certainly a boon. But there is something lost in translation here–the physicality of the game and the immersion of being around the table with friends, absorbed in a collective, competitive puzzle–that doesn’t replace the analog experience. Which is exactly how board game hobbyists would have it. Keep your devices close and your cardboard closer. 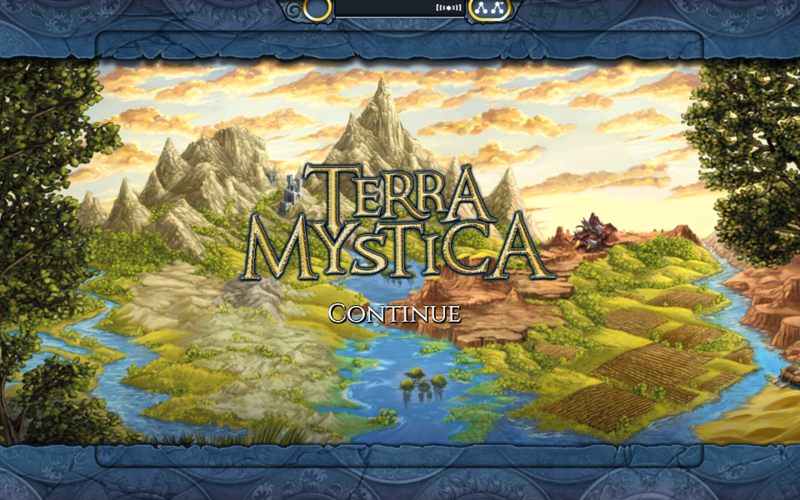 iSlaytheDragon would like to thank Digidiced for providing us with a copy of the Terra Mystica app for review. The app was reviewed on an Acer Iconia 8″ Android tablet.